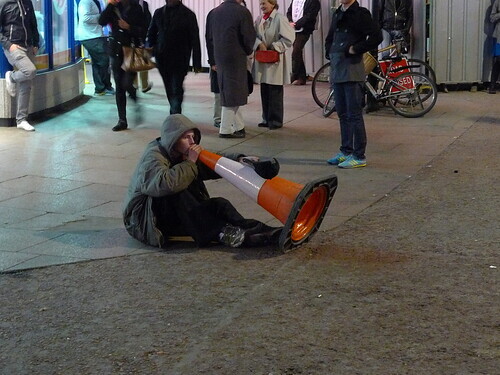 The gentleman in question appears to be a busker of some sort; he sits on the pavement, his mouth around the narrow end of the cone, making trumpet noises into it, presumably in the hope that someone will toss him some coins for his trouble. His repertoire consists mostly of snatches of popular songs, old standards and themes. The figure, sitting there in the middle of pedestrian traffic, burbling into a traffic cone, seemingly oblivious to the comings and goings of tourists and Londoners, seems like some non-specific element of as-yet undifferentiated satire or social criticism, some amalgam of Hogarth and Banksy, Chris Morris and Thom Yorke. But what does he represent? Is he the feral Other, attired in the uniform of Britain's demonised youth, brazenly possessing a traffic cone he is unlikely to have acquired legitimately, and embodying threat? 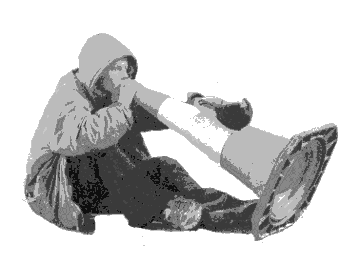 The drug-zombie, mouth clamped onto a pipe, oblivious to the morés of respectable society? Or the embattled Everyman, reacting to unreasonable circumstances in the only reasonable way, by curling up into a ball and gibbering? Is he a satire on the malaise of Broken Britain, or the mindset of the sorts of people who use the phrase "Broken Britain" in the mistaken belief that it was ever not, or both? A Victoria line Tube train waits at Kings Cross St. Pancras station, its doors open. A few people are seated in one carriage, waiting for it to depart. The door to the other carriage opens, and an elderly man walks in. He is attired neatly, wearing a suit jacket, and has white hair. He is bent over and carries in his hand a wooden crucifix. He walk along the carriage and, facing each person, points the crucifix at them, drawing a cross in the air, before moving on to the next person. The passengers react in various ways. Most ignore him. One makes devil horns at him with his hand, at which the old man remonstrates. His tone is mild and good-humoured, with an Irish accent and no trace of hostility or aggression, and he chuckles softly to himself as he speaks. One man (an African Muslim, by appearance and dress) appears agitated and uneasy at this aged crusader, and shifts in his seat; once he is gone, he pulls out a set of beads and passes them through his fingers with furious intent, as if to banish a spiritual taint. Holloway Road's closest Melbourne equivalent would be Sydney Rd., Brunswick. Grungy, downmarket, and running north-south through various working-class areas. (I think it's the street the record shop in High Fidelity is meant to be on, which basically is a way of saying that it'd be a small, obscure and struggling sort of place). There are no fashionable shops (except perhaps one near the Highbury end, which sells Ben Sherman gear rather cheaply), lots of bargain shops, discount phone-card vendors, internet cafés (the going rate seems to be £1/hour), halal fried chicken shops (the confluence of Islamic food-preparation doctrines and American-style fried chicken, often named after randomly-selected US states, is one of those puzzling artefacts of contemporary Britain, but I digress), and the odd McDonalds (though no Prets; that would be too posh). And most, but not all, of the shops have shutters (probably suggesting that the area used to be a no-go zone blacklisted by insurance companies, though has improved somewhat recently), usually covered with aerosol art. There are plenty of beggars, gnarled-looking trolls, working the streets; every cash machine seems to have an "attendant" sitting down beside it, ready to claim his perceived share of the privileged users' largesse. I've heard it claimed that Upper Street, Islington, is roughly equivalent to Chapel Street. Or possibly Brunswick Street, though probably not: Brunswick Street would probably be Camden High Street without the market; William Gibson called it the "Children's Crusade". North London seems like a rougher environment than inner Melbourne. There's a faint vibe of aggression in the streets, evident in groups of hard-looking youths. And then there are the local community newspapers: where the inner-Melbourne papers go on about insufficient community health-care funding and insensitive high-rise apartment developments, the papers here talk about gay-bashing youth gangs and muggings in broad daylight, and you know you're in a grittier, more hard-edged reality. Keep moving, don't make eye contact, and try not to look like a soft target. Highbury (which is east of Holloway Road) is a pleasant, village-like place; small shops and restaurants, leafy streets and a quiet atmosphere. The area around Highbury Grove/Blackstock Road (or A1201; given how often British roads' names change, most major ones are known by a number instead) and near Arsenal football stadium in particular seems rather pleasant.